Miden Medical operates a fully equipped production facility for the manufacture of veterinary anaesthetic machines & veterinary equipment. Miden Medical operates a fully equipped production facility using state of the art CNC lathes and milling machines for the manufacture of animal anaesthetic machines, and veterinary equipment. 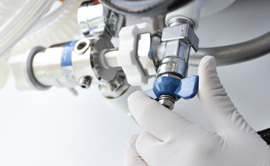 We also produce medical gas products, medical hoselines, circle absorbers, and oxygen regulators. Miden Medical also produces custom made equipment. An organisation that implements an effective quality management system will benefit from stakeholders and customer confidence. A quality management system is what ensures a business' products meet a certain level of quality, are reliable, safe, continually improve and comply with the law.